One of the biggest issues in every industry, either in production or in service providing as terminals are, is the optimization of the maintenance policy. The share of maintenance costs in the total costs of every industry is very big and minimizing them has been a research objective since the beginning of mechanization in production. As the equipment got more complex and expensive, the need for effective maintenance appeared, and this can be shown in the three different stages in the evolution of maintenance concepts. The most modern concepts optimize age replacement times by taking into account several different failure distributions of equipment. Moreover, modern maintenance concepts like RCM and TPM have appeared and emphasize in the qualitative improvement. The innovation they propose is the involvement of all the levels and departments of a company and as they showed their effectiveness they are being adopted by an increasing number of companies nowadays. Furthermore, an important part of having effective maintenance is the synchronization of maintenance needs with the spare parts inventory. The inventory costs, another big cost center in many industries, compromise in a big part from holding costs for spare parts inventory. The optimal spares inventory management can relief a company from over-stocking and also minimize downtime due to shortage of a specific part. It is apparent thus, that cooperation with the maintenance department is of utmost importance in order for both departments to benefit. 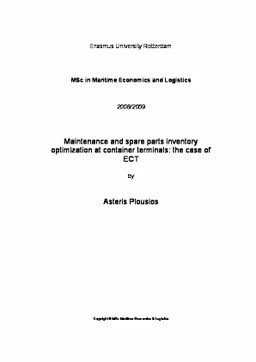 This thesis addresses the above issues in the terminal industry, where little research on maintenance has been made and tries to connect optimal maintenance policies with the spare parts inventory management. The real-life application on Europe’s largest container terminal, ECT in Rotterdam, gives important results on the importance of data input, organization and company mentality in the overall effectiveness of the proposed methods.